Hulk Hogan vs. King Kong Bundy, WrestleMania II. We are saddened to inform you that WWE legend King Kong Bundy has passed away at the age of 61. Promoter David Herro took to Twitter to break the unfortunate news after confirming with the wrestler's family and friends. Bundy was a mainstay in the WWE in the mid-1980s as he featured in some high profile matches. His WrestleMania 1 match against SD Jones, which ended in a 23-second win for Bundy, was the shortest match in 'Mania history until it was broken in 2008 by Kane, who beat Chavo Guerrero in 11 seconds to win the ECW title. 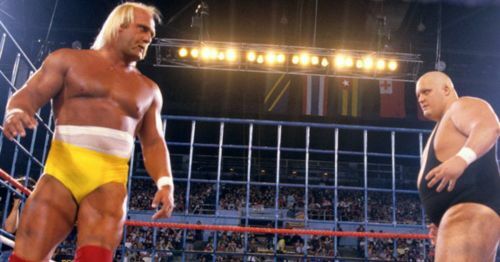 Bundy would go onto to wrestle Hulk Hogan the following year at WrestleMania 2 in the first ever singles main event at the Show of Shows. It was also the first ever Steel Cage match in 'Mania history and was for the WWF World Heavyweight Championship. King Kong would leave WWE in 1988 and would wrestle sporadically before making a comeback in 1994 as part of the Million Dollar Corporation. His second stint was underwhelming, to say the least, as he was used merely as an enhancement talent. He would quit again in 1995 and would continue to work on the independent circuit until 2007. Bundy also dabbled in acting and stand-up comedy in the latter half of his career. The exact cause and time of Bundy's death are still unknown and more details on the same should be revealed in the coming days. We at Sportskeeda would like to convey our heartfelt condolences to the family and friends of the legendary wrestler. May God grant them the fortitude to deal with the loss. Rest in peace King Kong.